A financial plan is only as good as the questions being asked when creating it. But beyond the platitude of needing to ask "good" questions, what does this really mean? 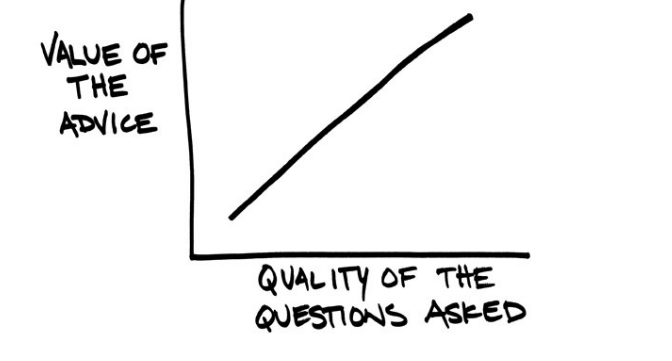 After all, does anyone think the questions they ask are not good ones? The way to be less subjective and more deliberate is to consider the different types of questions utilized in the planning process. I suggest using what could be called “3D Client Inquiry” since it involves the following three categories: data gathering, diagnosis, and discovery. Each of these serve a unique and distinct purpose. * Data Gathering Questions – This is the most straight-forward type of inquiry. Data gathering is quantitative in nature and involves fact finding with respect to assets, liabilities, inflows, outflows, etc. Financial planning requires figuring out where a client is today as compared to where they want to be. And just like you can't give directions to someone if you don't know where they are coming from, you can't do proper planning without knowing all about their current financial situation. Effective data gathering is what provides the “GPS coordinates” needed to truly understand the location of a client’s current position in order to guide them to where they need to be. * Diagnostic Questions– Diagnostic questions are concerned with identifying a particular problem. These are the types of questions a client should be able to answer, but often cannot. They are particularly effective for prospecting because it implies you work with people like them and have ideas and solutions for the unique types of issues they face. Successful diagnostic questioning helps provide peace of mind to clients in knowing that you are anticipating issues that may arise and insulating them against these problems no one else is thinking about. However, unless you specialize in working with a particular niche of clients, it is difficult to do this well. That’s due to that fact that it requires a familiarity with common problems or opportunities that might arise for that particular person. By way of example, let's assume you are meeting with a business owner. Data gathering may involve asking whether he has a buy-sell agreement or key person insurance, whereas diagnostic questions seek to understand the implications of those things. For example: "What happens to the business if you're no longer around to run it?" Here's another example. For purposes of data gathering, you might ask, "What is your business worth?" A related diagnostic question is, "What does it need to be worth in order to reach your goals?" * Discovery Questions – Discovery questions are often conflated with data gathering, but they are different. If data-gathering questions are about "what you have," discovery questions are about "what you believe." Whereas data gathering questions might focus on the timing and spending needs in retirement, discovery questions are about understanding what a meaningful and successful retirement looks like. The goal is to discern what's most important to the client in terms of relationships, passions, health, etc. A classic representation of comprehensive planning is a puzzle where all of the pieces need to fit together. All financial decisions are interrelated and contingent on one another. But all too often, something is missing from this analogy. Often, during presentations, I’ll tell clients to imagine a puzzle with a thousand pieces laid out on a table in front of them. Then I ask them, “What’s the single most important piece of the puzzle?” Rarely does anyone ever get it right, but when I tell them it’s the picture on the top of the box, it intuitively makes sense to them. Everyone knows you need to first understand the scene you are trying to piece together in order to build a puzzle. Likewise, before going about trying to put all the pieces together to build a financial plan, we first need to have a really clear vision of what their ideal future looks like. True discovery paints this metaphorical picture on the top of the box. Hopefully, you can see how each of these types of questions serves a unique purpose. Data gathering questions ensure that we have the proper information to do analysis and make recommendations. Diagnostic questions bring intentionality to planning by ensuring that clients are aware of the consequences of various aspects of their financial situation and decisions they have made thus far. Discovery questions infuse a plan with meaning by facilitating conversations about what's most important to the client and then anchoring the plan according to those values. This 3D approach to client inquiry is what will really bring a plan to life.